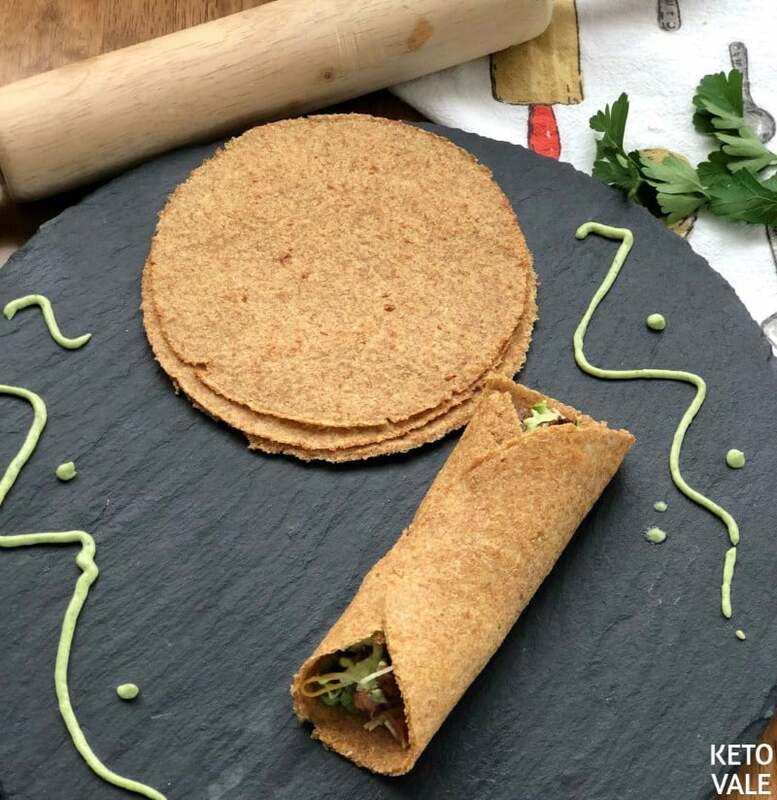 These super easy and delicious homemade tortillas are an excellent option for a low carb taco night. 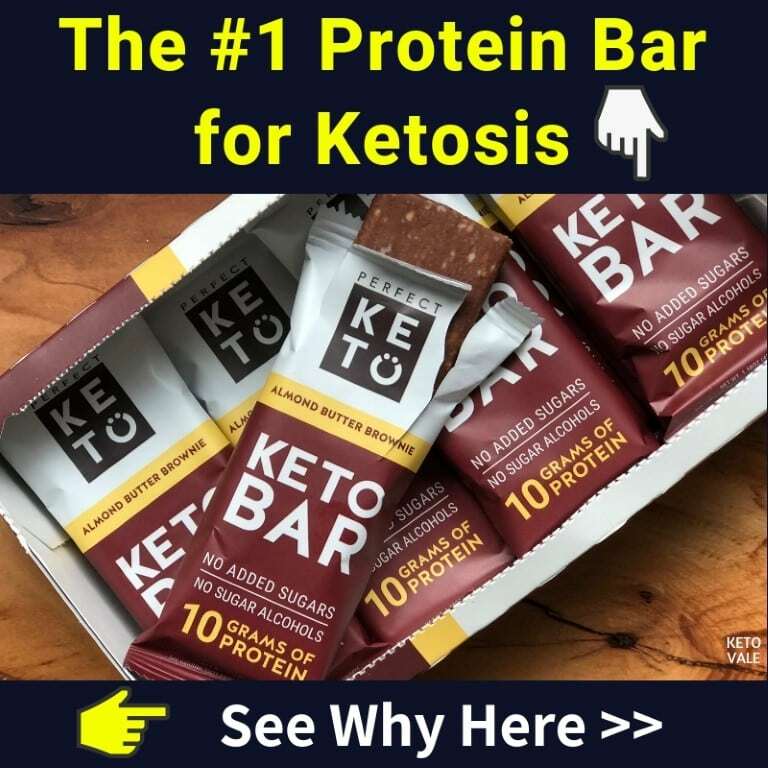 You will be surprised at how simple and fast these are to make and I can guarantee it will change Tacos Tuesday’s for all ketoers. 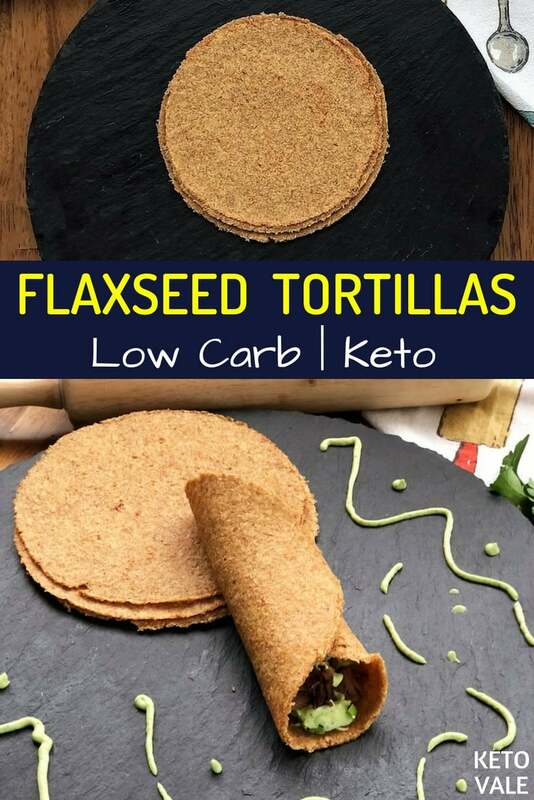 We used golden flaxseed meal as the main flour for these gluten free tortillas but you can use regular flaxseed meal if that is all you have on hand. Flaxseed is rich in fiber. One tablespoon of flaxseed (7g) consists of 1.9g dietary fiber out of 2g total carbohydrate, which essentially makes it only 0.1g net carb! Flaxseed is one of the best keto fiber supplements. 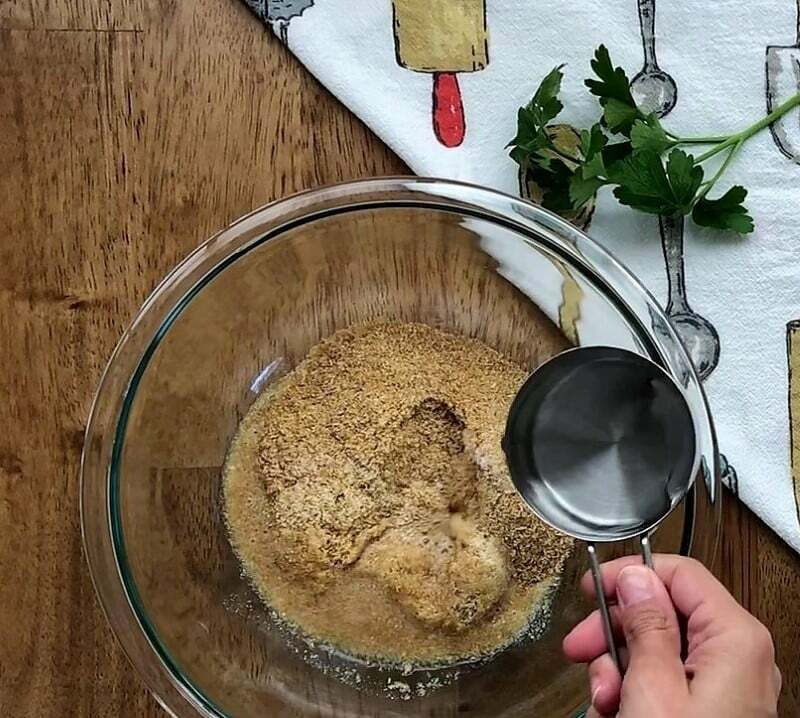 It has so many health benefits including lowering cholesterol and blood pressure; controlling blood sugar, and helping with weight loss by reducing hunger (1, 2, 3, 4). Since it is so fiber-rich, adding flaxmeal into your diet will also help prevent constipation on keto. The recipe yields around 4 medium size tortillas so if you prefer small you can use a different size cutter. It is definitely worth making 2 batches of this recipe and having a few extras on hand for the week. 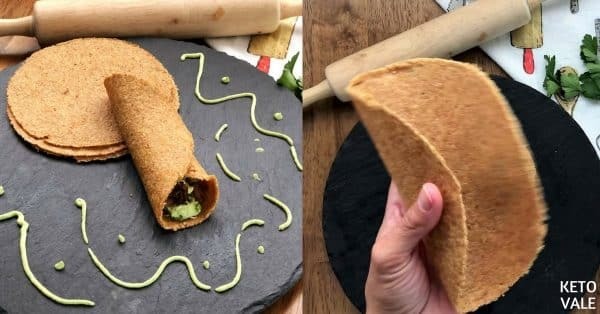 These can be used for keto tacos, wraps, burrito or even for quesadillas, you can even make Mexican pizzas with it. It is very important that the dough is cold before you start rolling. Also, keep in mind that you might need to adjust the water amount depending on your situation or type of flaxseed meal. The dough should come together but not too dry or too sticky on your hands. When cooking, make sure not to overcook or they will lose the elasticity and get hard, so 2-3 minutes max on each side is enough. Give it a try and you will love this new addition to your meals. Add flaxseed meal, garlic powder, onion powder and salt in a bowl and mix well. Add the hot water slowly in and mix again. Shape the dough. Keep it cool in the fridge for 30 minutes. 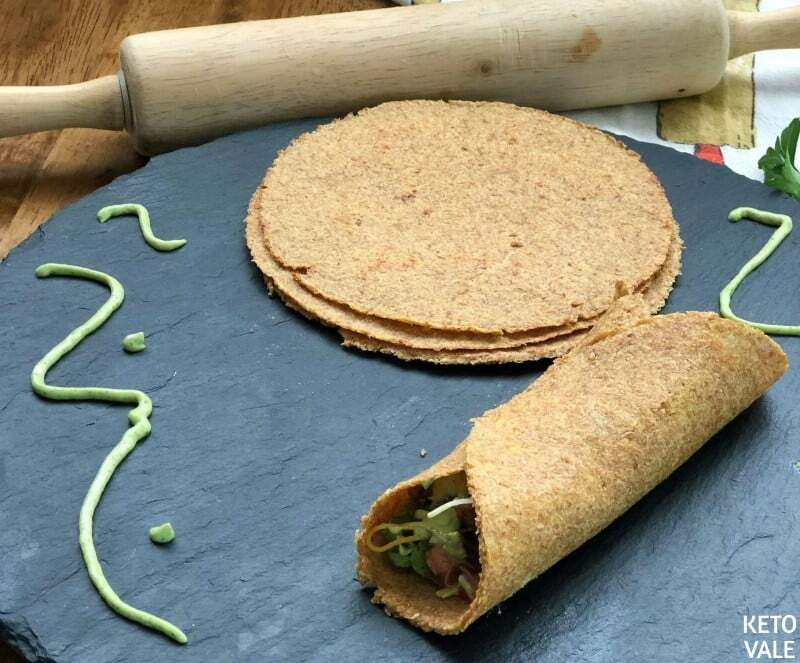 Remove from the fridge, roll the dough using a rolling pin and parchment paper until you get a thin tortilla shape. Cut it into a circular shape with your desired size. Put the leftover edges together and repeat the process until you finish using the dough. It should make 4 medium size tortillas. Spray coconut oil (or olive oil) in a pan over medium heat and brown the tortillas for about 3 minutes on each side until cooked. Add your favorite fillings in and enjoy! We use roasted shredded beef, cheese, lettuce, parsley, tomato, and guacamole sauce. Feel free to create your own version! 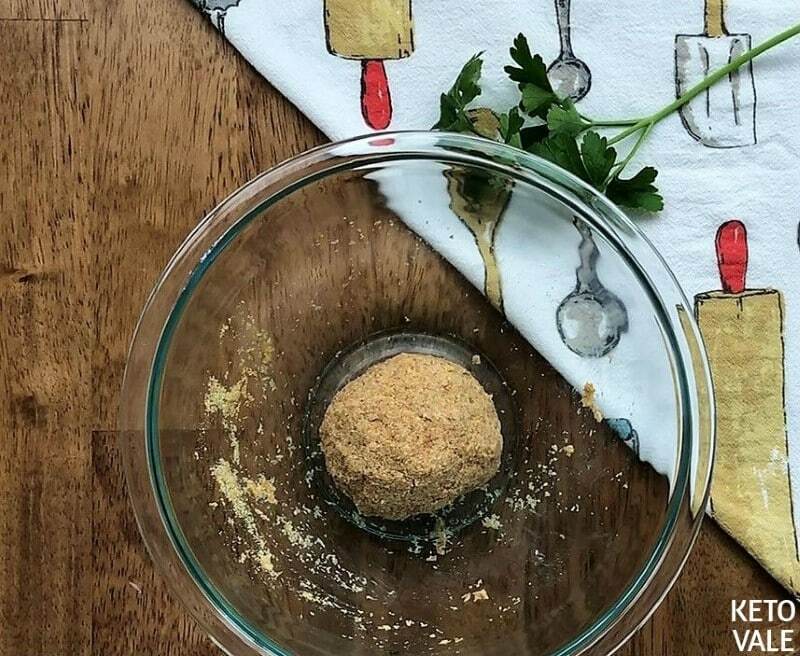 In a bowl combine all dry ingredients and mix well. Add the hot water and combine. 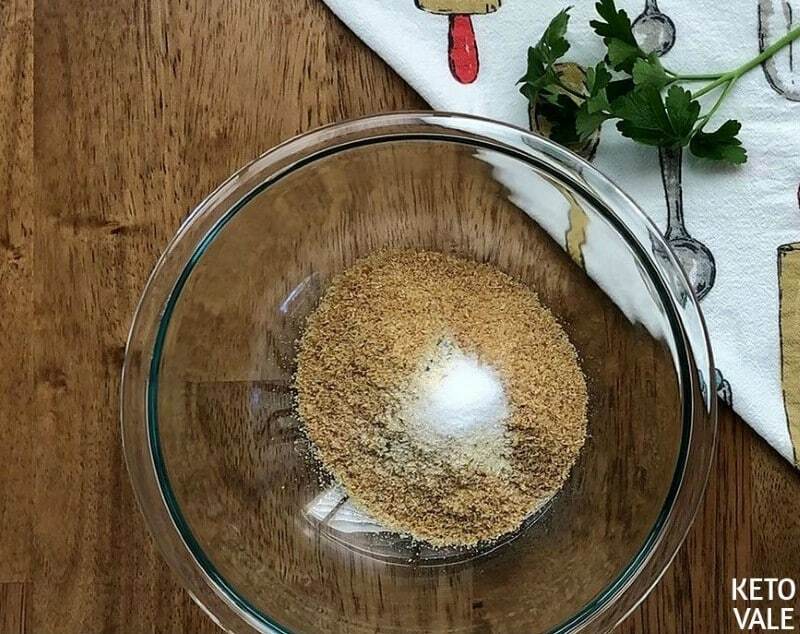 The flax seed meal will absorb the water and you can shape it into a bowl. Take it to the refrigerator for about 30 mins or until the dough is cool. Using parchment paper roll the dough using a rolling pin until thin. 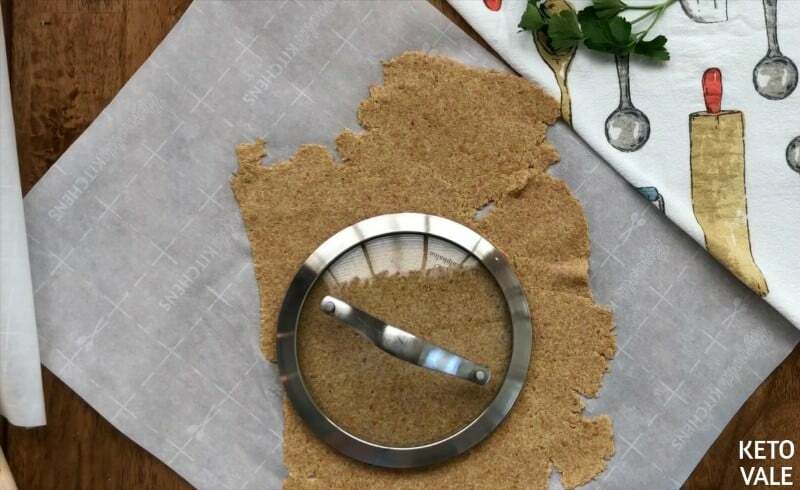 Using a pan lid cut it into a round shape. Put together the leftover dough and repeat the rolling and cutting until there is no dough left. 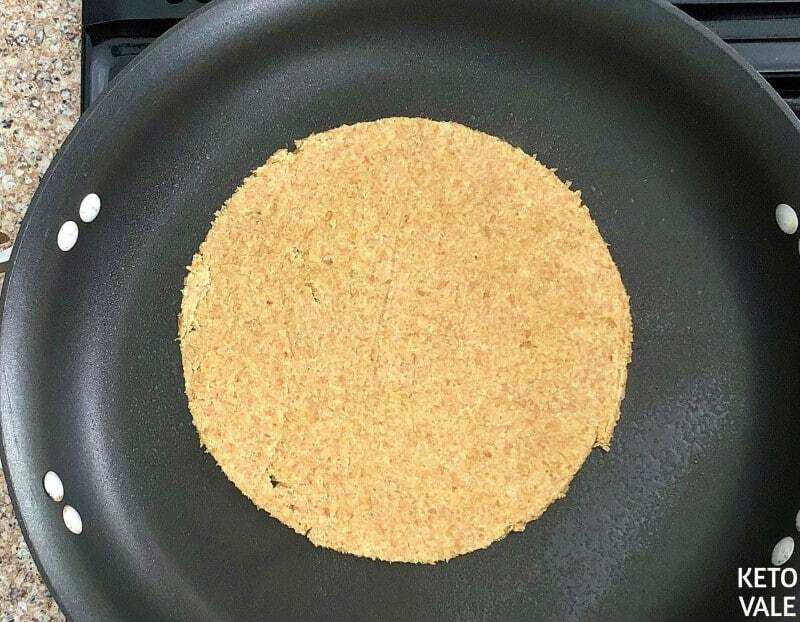 Spray a nonstick frying pan with coconut oil and cook the tortillas on medium heat for about 3 minutes in each side. Top it with your favorite fillings and enjoy!